Wetlands enjoy reputation of the most economically valuable and the most biodiverse ecosystem in the world. 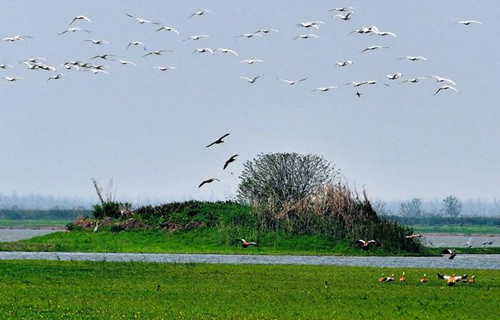 Known as the province of a thousand of lakes, Hubei boasts wetlands of 1.445 million hectares, accounting for 7.8 percent of China’s whole land. 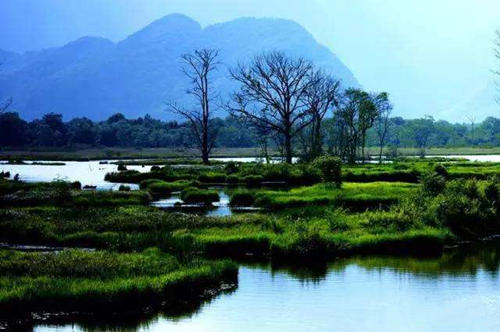 At present, Hubei has four wetlands inscribed into the list of Wetlands of International Importance by the Ramsar Secretariat. 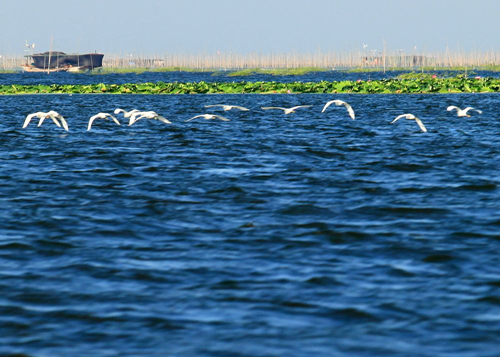 They are Chen Lake Wetland Nature Reserve, Dajiu Lake Wetland, Honghu Wetlands and Wang Lake. 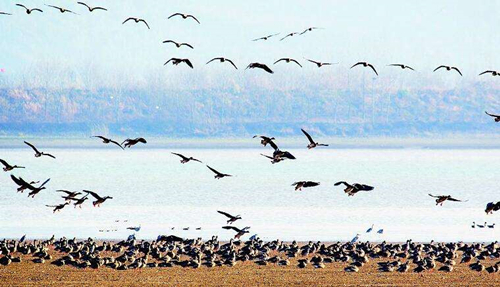 An Important Bird Area and Provincial Nature Reserve, the site is situated at the confluence of the middle reaches of the Huangsi and Tongshun River systems, regulating flood water in the Eastern Jianghan Plain and guaranteeing the safety of Wuhan City, 45km away. Large permanent freshwater marshes and freshwater lakes support a total of 140 species of birds, of which eight occur in internationally important numbers. The vulnerable Chinese Water Deer Hydropotes inermis can be found here. In addition to its important role in groundwater recharge, flood storage and fish production, the site is important for environmental education and tourism, with about 20,000 visitors annually. 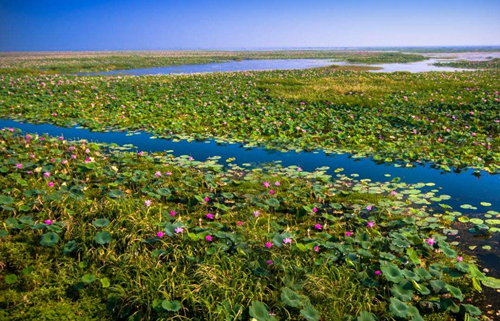 Dajiuhu National Wetland is the largest and highest wetland in central China. It is surrounded by mountains and a total of nine different lakes are connected by a flowing stream. 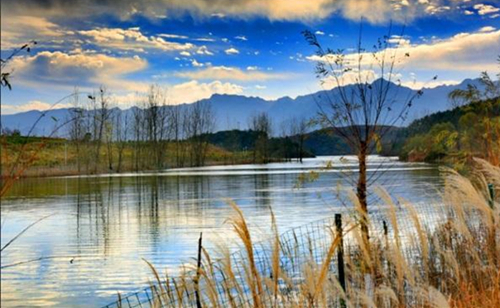 The nine lakes compose the Dajiu Lake, which means “nine big lakes” in Chinese. It is a rare representative of a typical subalpine sphagnum bog wetland located in subtropical central China. It lies in the watershed of Yangzte and Han Rivers, close to the Shennongjia Forest District, one of the “WWF Global 200”. The wetland represents the source of the Du River, a first level tributary of the Han, and has great value in the biogeographic region for flood control, climate regulation , groundwater recharge and water purification. Several threatened species of plants, waterbirds and mammals occur at the site, including the critically endangered Veitch’s Spruce Picea neoveitchii, the endangered Oriental Stork Ciconia boyciana and Forest Musk Deer Moschus berezovskii. The seventh largest freshwater lake of China, located on the northern bank of middle Yangtze river along the East Asian - Australasian Flyway. IUCN Red Listed species like Anser cygnoides, Ciconia boyciana, Mergus squamatus, Aythya baeri, andMetasequoia glyptostroboides are found here, and the site supports 1% threshold for Phalacrocorax carbo, Podiceps cristatus, Anser anser, Anser fabalis, Anser albifrons, and Platalea leucorodia. The aquatic, polar and willow vegetation provides habitat for 139 bird species, 62 fish species,6 amphibian species, 12 reptile species,13 mammal species, 379 zooplanktons, 472 vascular plants species and 280 phytoplankton species. Flood regulation, fisheries, regional climate regulation, and water quality enhancement are ecosystem services provided by the site. In the past, reclamation, construction, and aquaculture were threats at the site; however, since the designation as nature reserve, these threats have been improved. Qingshui fort, at the centre of Honghu Wetland, is a relic of Wuling and the famous ancient battlefield of 208. 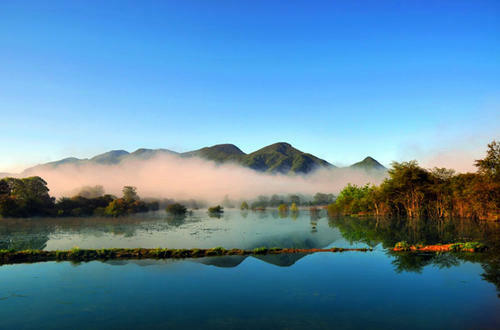 Located between the Mufu and Dabie mountains of central China, the Site is a complex wetland ecosystem with inland shallow lakes, flooded marshes and permanent rivers where wetlands and forests develop in succession. Surrounded by mountains and hills in the catchment of the Fu river (a primary tributary of the Yangtze), the relatively isolated and near-natural Site provides habitats for a wide range of wildlife. There are 591 vascular plant species, 46 zooplankton, 30 zoobenthos, 74 fish species, 33 amphibians and reptiles, 167 birds and 25 mammals. It supports a variety of rare and threatened species such as the critically endangered Chinese pangolin (Manis pentadactyla) and Chinese sturgeon (Acipenser sinensis); the endangered Japanese eel (Anguilla japonica) and Chinese forest musk deer (Moschus berezovskii); and the vulnerable serow (Capricornis sumatraensis) and lesser white-fronted goose (Anser erythropus). It also provides important stopover and wintering grounds on the East Asian – Australasian Flyway for 20,000 to 50,000 birds. 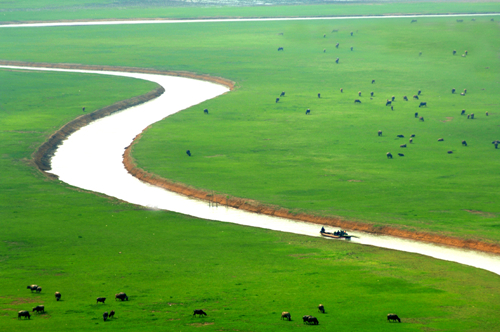 80% of the inflow from the north slope of Mufu mountain and Yangxin County is discharged into the wetland and so it serves as an important flood buffer system for the Yangtze and Fu rivers.